At least 14 people have been killed and 20 wounded in an Israeli air strike on an alleged night training exercise by Palestinian fighters in Gaza City. The Israeli army said its air force targeted a sports field used by the militant group Hamas. Witnesses reported hearing at least four loud explosions in the east of the city at around midnight (2100 GMT). Israel vowed to pursue Hamas following attacks in the city of Beersheba last week that killed 16 people. The missiles struck a sports ground named after assassinated Hamas leader Sheikh Yassin, in the city's eastern Shajaiyeh district, reputedly a stronghold of the militant group. The Israeli defence force said in a statement it had "targeted a training field during training of Hamas terrorists". Hamas spokesman Mushir al-Masri denied it was used for training, calling it a summer camp for Palestinian youth, the Associated Press reported. "It is an open war between the Zionists and us," he told Reuters news agency. 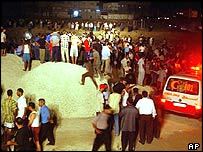 Israel said it had attacked the field from the air, and local people reported hearing a helicopter overhead at the time of the blasts. The BBC's Alan Johnston in Gaza said the strike left appalling devastation, with body parts scattered across the football pitch. Rescue workers rushed to the area, using candles and torchlight to search for victims. Palestinian hospital sources said 14 people had died and, with a number critically injured, the death toll may rise. 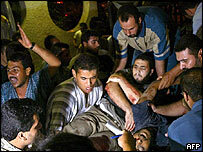 There were angry scenes at Gaza's main hospital as Hamas members, soaked in blood, brought in their wounded comrades. Israeli helicopters often strike at militants in Gaza City, but they normally only target one or two people at a time, says our correspondent. The attack ranks as one of the hardest blows that Israel has dealt Hamas since the Palestinian uprising began in late 2000, he adds. The movement has sworn that it will take revenge. The Gaza Strip has been occupied by Israel since it captured the territory from Egyptian control in the 1967 war. Israeli Prime Minister Ariel Sharon is planning to pull all its 7,000 settlers from Gaza and the troops that protect them as part of a disengagement plan. Israel will maintain control of Gaza's borders, coastline and airspace. Hamas claimed responsibility for the suicide bomb attacks on two buses that killed 16 people in the southern Israeli city of Beersheba on 31 August. The group said it was to avenge the deaths of two of their leaders, including Sheikh Yassin who was killed in an air strike in March. Israel responded by vowing to hit Hamas leaders "wherever they are". Four Palestinian teenagers were killed when Israeli troops moved into the central Gaza town of Deir al-Balah last Thursday to uncover a tunnel believed to be a hiding place for weapons. A day later, Israeli attack helicopters destroyed a warehouse in Mughazi refugee camp, central Gaza, claiming it was used by Hamas to make weapons. "A serious blow to the progress of peace in the region"